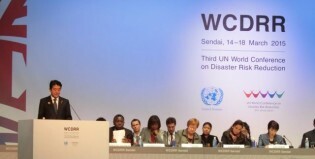 Women play a critical role in reducing disaster risk and planning and decision-making during and after disasters strike, according to senior United Nations, government and civil society representatives. Cyclone Pam has not only caused unprecedented damages to the Pacific island of Vanuatu but also lent urgency to U.N. Secretary-General Ban Ki-moon’s plea that disaster risk reduction is in “everybody’s interest”. Sarcastic laughter erupted when a civil society representative expressed his “admiration for the delegate of the United States, who with one insensitive, ill-timed, inappropriate and diplomatically inept intervention” had “managed to dispel the considerable goodwill the U.S. had garnered by its decision to participate” in Vienna Conference on Humanitarian Impact of Nuclear Weapons. There was a sarcastic laughter when a civil society representative expressed his “admiration for the delegate of the United States, who with one insensitive, ill-timed, inappropriate and diplomatically inept intervention” had “managed to dispel the considerable goodwill the U.S. had garnered by its decision to participate” in the Vienna Conference on Humanitarian Impact of Nuclear Weapons. For the first time, ‘humanitarian diplomacy’ is being deployed to drive home the need for banning nukes - though under the self-imposed exclusion of the P5, the five permanent members of the UN Security Council, who own a crushing majority of the 19,000 nuclear weapons capable of destroying the world many times over. Japanese parliamentarians and activists pin high hopes on the hotly debated and much anticipated U.S. Nuclear Posture Review (NPR) to which the Barack Obama administration is reported to be giving finishing touches.